After completing the Rheinsteig in 2010, I looked for another German trail to walk the next year and wanted one that could be completed in about a week. This narrowed my selection down to three possibilities, each of which could be completed in 8 stages. They were the Rennsteig, Rothaarsteig and Malerweg. Although the Rennsteig is the most famous German trail, I decided against it because I wanted to walk the trail in May which is a busy time. This coincides with the annual "Rennsteig-Lauf" race. The Rothaarsteig seemed promising, but accommodation near some of the stage points is limited and there are no available accommodation packages for solo walkers. Both trails also require awkward train connections from Köln (Rothaarsteig) or Frankfurt (Rennsteig). This left the Malerweg (Painter's Way), located along the Elbe river in a unique area of Germany between Dresden and the Czech border. The Malerweg trail was opened in 2006 and was voted "Germany's most beautiful hiking path" in 2007. Much of the 112Km trail is through the Sächsische Schweitz National Park. The park is renowned for its spectacular sandstone mountains which have formed into bizarre shapes. The name "Sächsische Schweitz" (Sachsen Switzerland) was given by two Swiss painters, Adrian Zingg and Anton Graff. The area became popular with artists of the Romantic era, notably Caspar David Friedrich. There are eight recommended stages to complete the Malerweg. Although the daily stages do not appear to be long, they involve quite a few steep ups and downs which makes the Malerweg more interesting than just easy forest trails. The deciding factor was that the Malerweg is easy to get to, being a very short distance from Dresden Airport. Lufthansa have flights from Heathrow every day. There also appears to be no shortage of accommodation in the spa towns of Sächsische Schweitz and there are excellent public transport links in the area with trains, buses and also boats along the Elbe. This enabled me to base myself centrally for a few days. The official website gives a wealth of information (similar to the Rheinsteig website) and makes planning the trip very simple. I ordered some brochures online and also purchased the related Publicpress map and Hikeline Wanderführer to aid in planning the trip. After spending much time browsing and researching on the Web, I felt that I already knew the area intimately at least two months before my trip. 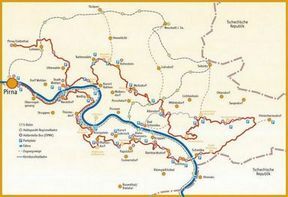 I made my plans to walk the Malerweg in May 2011. This involved reserving accommodation via email & buying a Lufthansa round-trip ticket from Heathrow to Dresden on May 7th 2011 for £85.